Relaxation. A place to rest. A much needed break. Red King swam across the vast waters of the Pacific Ocean. Things became too much for the King on his former homeland. He needed to find a balanced place to relax, to rest, and most importantly, take a break. The brutish savage had been pummeling monsters for so long he'd grown tired of it. For months, Red King searched for an island to claim as his territory, and finally, he found a mass of land that seemed suitable. The ruthless monstrosity, Red King, marched onto the sandy shores of Sollgel Island. Every stomp formed a massive foot mark in the sand beneath his feet while ocean waters dripped off of his bumpy flesh. Traveling inland, the brute shoved countless palm trees aside, creaking and snapping every time, until coming upon the region of a luscious jungle. The scenery was beautiful. Usually, the term 'beautiful' meant broken kaiju and bloodshed, well, at least to Red King that's what it meant. But today was different. His bloodthirsty nature and savage ways were something he liked to keep in the past. Everything within range was silent and peaceful...but something didn't seem right. A faint noise sounded from a mystery, causing Red King to turn his head around in confusion. Red King hit his pint-sized skull multiple times with his fists, trying to snap out of whatever he was oddly thinking about. He began to worry and become anxious about his surroundings. It was too quiet for a jungle and he knew this. The now former savage of kaiju proceeded to step further into the jungle. Suddenly, an ear-piercing buzzing sound erupted from the trees, creating gust winds that blasted into the southern direction. Red King almost had a heart attack. After the gust storm, a massive insect burst out of the jungle and into the sky, revealing its olive green exoskeleton, four legs, bulbous yellow eyes, and menacing scythe-like claws. Kamacuras, the giant bug that was mutated by radioactive storms on this very island, let forth a screech of challenging might. This was his island, his home, not Red King's. How dare this walking corn on the cob approach its sacred territory? It might be larger than he, but it's just going to end up like every other creature he had encountered: a meal. Like a lightning bolt, Kamacuras dashed at his newest prey, splitting thin air. The speeding insect came to a screeching halt and made an attempt to slash his opponent's head off. Red King ducked at the last possible second, his life could've been over. Kamacuras flew behind Red King and attached himself to his bumpy back. The giant mantis whacked his enemy over and over with his deadly claws. Red King hollered out as his backside was being assaulted continuously. 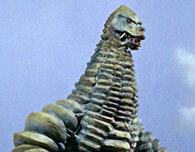 The victimized kaiju threw his hands behind him, trying to grab his attacker and throw him off. His attempt was futile as Kamacuras shot in front of him and bashed his puny skull with his left claw. Shrieking in irritation, Red King held his head with his hands. It began to ache and throb. In a split act of anger and desperation, the brute swung his large hand at the insect, but it still managed to dodge with ease. Kamacuras smacked the back of Red King's head and sped off once again. The annoying bug was playing games with him. Its stupid tricks were starting to piss him off. Red King was not the one to be played with, let alone pissed off. There's a reason his first name was Red. If that's how the insect wanted to play it, that's what he's going to get. Kamacuras boomed as he flew at his enemy, its wind storms kicking up trees in the jungle. With a little speed of his own, Red King caught Kamacuras' arms with his massive hands and tossed him aside like a toy. The olive green mantis spiraled out of control before stopping itself. He was surprised that his opponent was able to accomplish such an act. The newly infuriated Red King ran towards his adversary, shrieking in hate as he did so. Kamacuras attempted to fly off, but Red King grabbed one of his four legs and held on tight. The massive bug released a panicked screech. In an act of desperation, Kamacuras bashed his claws into his opponent's skull multiple times with super speed. Red King had no other choice but to cater to his aching cranium, letting the irritating insect to flee from its demise. Looking up into the blue sky, the bloodthirsty brawler lets forth a vengeful shriek and pounded his chest with his fists back and forth. When all seemed to be set at a finish, something fast collided with his back, forcing him to crash face first into the dirt below. Red King stood on his feet, slapping himself in annoyance. This new attacker disappeared in an instant. Red King examined his surroundings, yet nothing but towering trees were in his eyesight. The mysterious being began to become visible and dashed through the trees as if it were a chameleon with wings. It was another Kamacuras. Red King saw it coming and grabbed the bugs thin arms, tossing that one aside also which nearly collided with the other oncoming Kamacuras. The duo exchanged chirps with one another as their enemy taunted them from the surface below. Their strategy was set, now it was time to play it out. The second Kamacuras flew directly towards his opponent. They exchanged blow for blow, claw for fist. The first Kamacuras attached onto Red King's back, but before he could throw him off, it sped off in a flash. Red King's left fist connected with the other insect's face, causing it to wobble like a bobble head and screech in agony. That Kamacuras also dashed away, leaving a nasty trail of dust behind. Thankfully, Red King was smart enough to shield his eyes. When the smoke cleared, both Kamacuras' zoomed in on their target simultaneously. Flying straight by, one slashed at Red King's right calf muscle while the other performed a twirling maneuver and delivered a sickening European uppercut to the brutish monster. Red King toppled onto his collarbone, hard, nearly snapping his neck and spine. It took a while to regain his footing, but he succeeded. Red King cracked his knuckles and did the same on both sides of his neck. Now it was time to get down to business. One Kamacuras came out of nowhere, but was treated with a crunching backhand to its face, driving it away. The other stealthy insect slashed at Red King's leg, but it didn't faze him. The monstrous savage kicked it with his tube-like foot and wrapped its meaty hands around the bug's head, ready to pop it like a balloon. Before that could happen, the second Kamacuras flew onto his back once again, giving the other some time to fly away. In a combination of quick speed and fury, Red King judo flipped the aggravating creature right onto its back, causing it to cry out in sudden pain. Crouching down, Red King began to pummel the fallen bug with his deadly fists, which started to crack its underbelly. In a flash, the insect's partner came to save it, but failed in doing so. Red King instantly slammed it to the ground with his massive right arm, creating a ground-rumbling thud. Now that that one was out of the way, Red King bent down and put the other Kamacuras in a deadly headlock. The crying insect was helpless as Red King squeezed his bicep around its frail neck, taunting him at the same time. With a sickening crunch, the insect's neck snapped in half, killing it instantly. The powerful brute dropped the limp form of his enemy and shrieked into the heavens above. It wasn't over yet, as the other Kamacuras slashed his face with the tip of his scythe-like claw. A minor cut was formed and a trickle of red blood slipped down Red King's cheek. He tapped the wound with his left palm and stared at it, seeing the sight of his own blood. Witnessing his own blood was rare for him. The only sight of blood he'd ever see was when he was crushing his opponents on the battlefield, turning them into a bloody pulp. It was a sight he loved most. The sadistic monstrosity was named Red King for that very reason. Now that he saw his very own blood, it fueled him with an uncontrollable sense of rage. Shrieking with fury, Red King flexed his biceps, clenched his hands, and forced them to combust into a fiery blaze. In one final act of defiance, the one living Kamacuras dashed at his enraged foe. Hoisting his left arm out with speed, Red King wrapped his murderous fingers around the oncoming insect's throat, grasping it tightly. It began to char and flame with hate. Kamacuras twitched uncontrollably as his enemy held him in a flaming death grip with only one arm. Red King was tired of the irritating insect's cries of despair. The savage brute brought his right arm back slowly, and finally, shot it outward. His flaming fist collided with Kamacuras' face so hard, it detached from his body, seizing its cries in an instant. The insect's cranium was sent sailing backwards before crashing and rolling across the soil. The life within its bulbous eyes faded out. The first Kamacuras was no longer apart of the living. Red King allowed the flames to die out. After dropping the mantis' lifeless frame to the ground, Red King pounded his chest continuously and let loose a shriek of triumphant victory. In this world, bugs will forever be a nuisance, a primitive species that were inferior to nearly every other organism. The Kamacuras duo never stood a chance in hell against the Skull Monster himself anyways. They forced the savage back out of him, now they meet their demise. They were dead. An exhausted Red King began to march further inland, passing by a huge mountain. A much needed break was something he'd never achieve as long as there were other monsters around that needed a pummeling. On the other hand, relaxation and a place to rest was something that could be achieved. If he's lucky, Red King might even find Sollgel's spring of red water.